Oxford County is asking residents: are you up to the solar challenge? The County is launching the Solar Oxford Challenge, an initiative that encourages up to 16 local residents or businesses to achieve net-zero electricity by reducing their electricity consumption and installing solar photovoltaic (PV) panels to offset remaining energy usage. Oxford County's Solar Oxford Challenge will award up to $1,000 to each participant that achieves net-zero electricity within one year. Learn more about the Solar Oxford Challenge. Oxford County has learned that its submission to Infrastructure Canada's Smart Cities Challenge, in partnership with all eight area municipalities, has not advanced to the finalist round. Learn more about the County's Smart Cities Challenge application. York University’s International Renewable Energy Academy (IREA) will be hosted by several Oxford County sites next week. The academy, which focuses on experiential learning, will be using Oxford County (Ontario’s first community committed to achieving 100% renewable energy) as a model of community-based renewable energy project development. Residents with an interest in renewable energy can join the County-hosted portion June 21-23, or attend a public event on June 22 at the Woodstock Art Gallery. For more information, visit the IREA website or see the newsroom posting. Community invited to learn more about "everyday energy"
Oxford County Library in Ingersoll is hosting an information session on “Everyday Energy,” an informal drop-in session and community panel designed to help people move to greener energy options. There is no cost to attend and people of all ages are invited to attend. The Woodstock Art Gallery and Oxford County partnered in the fall of 2016 on “The Art of Sustainable Energy,” a program featuring art that explores and responds to environmental themes such as nature, conservation, and renewable energy. A total of 450 grade 5 and 6 students from 10 schools across Oxford County took part. 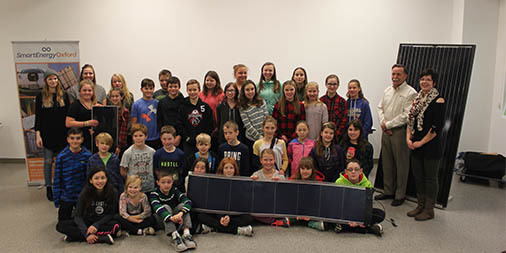 Shown here: Hickson Central Public School students from grades 5 to 7. Oxford County, Future Oxford, Smart Energy Oxford and the Oxford Community Energy Cooperative are partnering for this year's Green Energy Doors Open event to present the Oxford County Renewable Energy Gateway, a guided bus tour of four local renewable energy technologies. Hourly bus tours depart between 9:00 a.m. and 7:00 p.m. from the Tesla Super Chargers at the Quality Inn & Suites on Saturday, September 10, 2016. In a blog for World Future Council, Anna Leidreiter takes a comprehensive look at how the framework was laid for the Draft 100% Renewable Energy Plan. The original June 24, 2015, motion put forward by Woodstock Mayor and County Councillor Trevor Birtch, placed Oxford as the first municipal government in Ontario to commit to a renewable energy target and only the second in Canada after Vancouver, BC. Now, the Draft 100% Renewable Energy Plan lays out a framework for how community, business, government, academic, national and international partners can work together to support Oxford in becoming a “100% RE” community. When fully developed, the plan will also include specific targets, milestones and actions. Members of the community can read the Draft Plan and submit their questions, comments and feedback over the next 60 days at www.oxfordcounty.ca/speakup. In November 2015, Oxford County Warden David Mayberry and Smart Energy Oxford Co-Chair Jay Heaman took part in the Kassel International Dialogue on 100% Renewable Energy. This two-day event gave government representatives from around the globe an opportunity to learn from each other and advance the “100% RE” agenda. Check out Oxford County in the Outcome Report on page 14. Creating a network of electric vehicle charging stations is a priority for Oxford County Council. On February 10, County Council supported the Oxford Electric Vehicle Accessibility Plan, allowing for the submission of an application to Ontario's Electric Vehicle Chargers Ontario (EVCO) program. If implemented, the Oxford Electric Vehicle Accessibility Plan will transform Oxford into a fully accessible EV community. Read more about the EVCO program application. Motion In Support of Oxford County Targeting 100% Renewable Energy by 2050.